Jeanne Angelique David, the 6th daughter and 15th child of Jean Pierre David and Marie Magdelaine Monmellian, was born on 21 December 1743 at Louisbourg and baptised the same day. Her godfather was Pierre Jouin, and her godmother Jeanne Bauche. Fre Athanase Guegot presided at the baptism. Jeanne Angelique's baptism record lists her father's name as Sieur Jean David, a resident of this parish, a name entitled to a person of great respect within the Louisbourg commiunity. In addition, the baptism record is the 3rd of 3 primary source recordings of the signature of Jean Pierre clearly illustrating an "X" over the " mark of the father, i.e., "marque du pere" at the end of the baptism record. According to the Fortress of Louisbourg Historical Memoranda Series 1964 to Present H F 25 1989 titled Jean Pierre David dit Saint Michel: Blacksmith authored by Eric Krause of Krause House Info-Research Solutions, Jean Pierre and Marie Magdelaine were still living at Louisbourg in 1744 along with their surviving children of "5 boys for certain, possibly 6 and 5 girls." These children would probably have included their 5 or 6 sons Jean Jacques, Jean Baptiste, Francois, Louis, Claude Thomas and Jacques Andre and their daughters Marie Josephe, Francoise Charlotte, Jeanne Olive, Marie Magdeleine and Jeanne Angelique. Michel, their oldest surviving son, had married Genevieve Hebert on 20 January 1744 in Grand-Pré, Acadie and was probably living there with his wife in 1744. This memoranda also states "In 1749, David returned to Louisbourg with 9 children and an orphan. Additional sons and daughters were: Joseph, Joseph and Anne Bernard (orphan)". However, it is believed that the Louisbourg 1749 - 1750 Census may have been misinterpreted and that Anne Bernard was not part of this family. By 1740, the War of the Austrian Succession (1740-1748) had engulfed Europe. As a result, by 1744 the mutual declarations of war between France and England, which had soon spread to North America, was seen as an opportunity by British Colonists in New England who were increasingly wary of the threat the Fortress of Louisboug posed to their fishing fleets working the Grand Banks of Newfoundland. 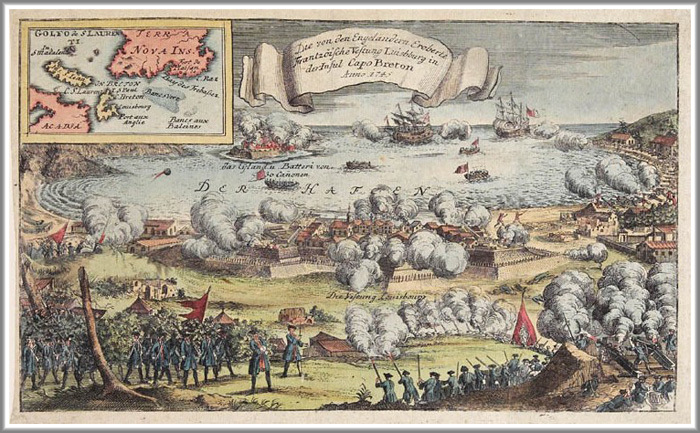 After a 47 day bombardment, a New England British colonial force lead by General William Pepperell supported by a British fleet commanded by Commander Peter Warren captured the Fortress of Louisbourg on the 16th of June, 1745 with the French capitulating 2 days later on June 18th. The first order of business for the victorious British Colonists, by the terms of the capitulation, was to expel all French inhabitants of Louisbourg. including the French administrators and soldiers, and transport them back to France. The British stripped their 40 gun Warren ship, the Launceston of all but 2 of it's guns and fitted the ship with cabins for the French officers and their families. The Launceston along with some small transports belonging to the colonies, left Louisbourg on 2 July 1745 with 1,500 French colonist including the governor, intendant, most of the chief officers, regular troops, men, women, and children. Another 400 French inhabitants, less important types, were loaded on smaller auxiliary vessels and sent off. The Launceston deportation fleet arrived at Belle Ile, France on 15 July 1745. One of those Louisbourg officials was Francois Bigot, financial commissary of Louisbourg. It is recorded that sometimes after arrival at Belle Ile, Francois Bigot was sent to Rochefort where he was charged with organizing preparation of rations for the expedition for the recapture of Ile Royale. That expedition was plagued with a deadly storm, crew illness and unexpected change of command and apparently failed in June 1746. It is believed that other expelled Louisbourg French inhabitants also migrated to Rochefort including the family of Jean Pierre David. For in December of 1745, tragedy once more visited the lives of Jean Pierre and Marie Magdelaine with the passing and burials of 2 more of their children within a one weeks time, , Jeanne Angelique and Francois David, in Rochefort, France. On 14 December 1745, Jean and Marie's 6th daughter, Jeanne Angelique, died at the infant age of 2 years and was buried the next day at the church parish of Saint Louis, Rochefort, France. Jeanne Angelique' brief life story can be fully told within 2 transcription source records which document her birth and baptism in 1743 and her death at the age of 2 years and internment in 1745. Jeanne Angelique or Jeanne Olive - A mystery finally unraveled by François Roux on 8 April 2012. The Louisbourg baptism record and the Rochefort, France burial record above that displays Jeanne Angelique's middle name finally confirms that the numerous records that have been uncovered dating between 1745 and 1805 that display the name Jeanne David refer to Jeanne Olive and not her deceased younger sister, Jeanne Angelique. Jeanne Angelique's documented presence in Louisbourg is also recorded in a secondary source Family Reconstitution File of her father, Jean Pierre David, which is archived at the Fortress of Louisbourg National Historic Site of Canada. This Family Reconstitution File was abstracted and compiled from original source documents archived at the Archives of Canadian and the Archives Nationale.